Designers and framers provide a fantastic value in a tight economy. In today’s climate, we are learning to make the most of the assets that work for us. How can we change a room without a substantial investment? Simple: change the mood of the entire room with new artwork. Visual arts have the power to change the ambiance of a room at a cost-effective price. Our first collection (left) by Holland creates a contemporary setting. Neutral pallets are strong and growing in the marketplace. 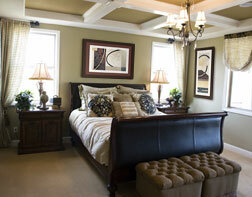 Warm browns with hints of blue-gray add strength to neutrals while strong contrasting black offers spherical accents. The organic texture in the color blocking adds a distinctive element to this collection. We see earth-inspired textures becoming increasingly popular as we conserve the beauty of our natural world. Our second collection (right) allows the designer a totally different perspective. The same room takes on a traditional feel with a global twist. We have selected artwork from best-selling artists Jeffery and Poloson. Rich spice color has lead the palette for several seasons and established itself as a durable color trend. Our rich textile-inspired patterns are found here in both artists’ collections. We see vessels widely used for tabletop accent and integrate that imagery into the artwork for a cohesive feel. Warm, rich colors and intricate detail in the artwork combine to create a global inspiration.